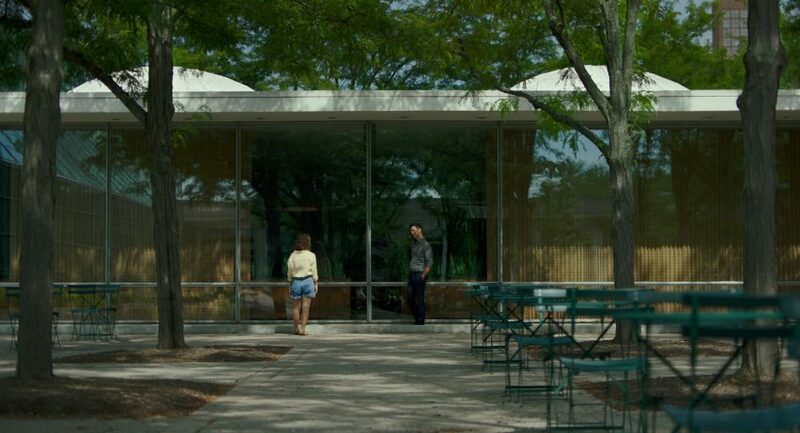 “Columbus” elicits shades of “Before Sunrise” by virtue of turning on a young woman, Casey (Haley Lu Richardson), and man, Jin (John Cho), who meet by chance and engage in philosophical conversation while exploring a scenic city. Yet I kept thinking less of “Before Sunrise” and more of “Museum Hours”, which was one part character study, one part documentary, wherein director Jem Cohen asked us to look at real life much like we might look at a painting hung in a gallery. 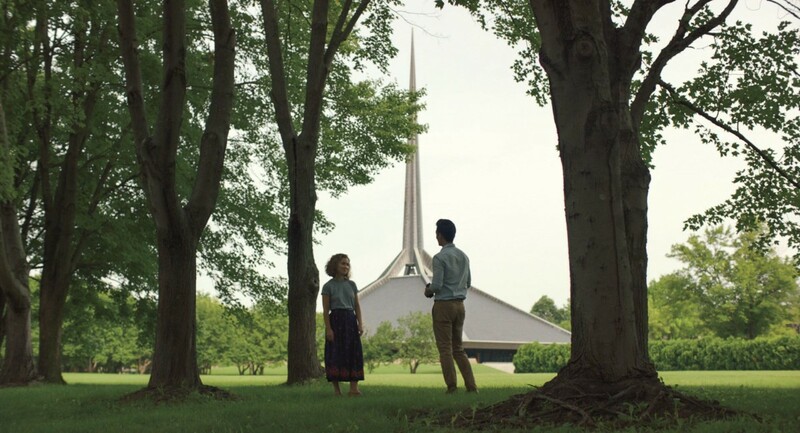 South Korean director Kogonada, however, goes even further with “Columbus”, set in a Midwestern mecca of architecture, Columbus, Indiana, by sort of metaphysically merging that architecture with his characters. You see this acutely in a sequence where the main characters stand at night outside the town’s idiosyncratically illuminated bank building. Casey says something about coming here for inspiration when life got rough, artificially sweetened dialogue if I ever heard it, but which Kogonada authenticates by allowing the building to hover in the shot, just above them, like some sort of deity, underlined by how Richardson has Casey steal glances of the building throughout their chat. The rhythms of her life, in other words, have always moved in time with the surrounding physical structures, as close as you will come to seeing actual life breathed into that standby phrase Dancing About Architecture. Columbus doubles as Casey’s home, which she has never left, college-aged but not in college, working at the local library, and taking care of her mother (Michelle Forbes), a recovering meth addict. And the movie, ever patient, takes time introducing us to her daily routine, before she encounters the other crucial character, Jin, visiting from Korea because his father, never really seen, an architectural theorist, is on his deathbed. Their introduction, a conversation over a cigarette, is in indicative of how every shot is thought out, with a fence between the characters, and as they walk and talk, Jin, a character who feels less open and a little more out of view throughout, disappears for an instant behind a fencepost every few steps, as if slipping out of and returning to focus, before the fence ends and they are simply…together. He hardly sees his father despite the old man’s precarious state. They haven’t spoken for a year. His father’s real love, Jin grudgingly explains, was the buildings, these in Columbus, and everywhere else. The emergent irony, even as a flicker of attraction develops between the two despite their age difference, is that Casey’s true love is the buildings too, so much so that she has a list of her favorites, which doesn’t feel like some sort of Top 5, “High Fidelity”-ish stab at self-definition but an affection that is as practical as it is lyrical. In one scene, she recites a building’s stats for Jin who teasingly calls her a tour guide, before he wonders how tour guides can stay in love with something so long, a statement bringing to mind Malcolm Miller, the English professor who moved to Chartes, Frances in 1958 to devote himself to its historic cathedral, a person more officially academic than Casey though she nevertheless evokes the idea of someone who has devoted herself to the place where she lives just the same. When Jin asks Casey specifically what she loves about the buildings, it is a testament to Kogonada’s style that he refrains from giving her a monologue, instead cutting to a shot from inside the building itself, looking out at Casey through the window, bringing up music on the soundtrack and cutting off her dialogue completely, allowing her to sort of intermix with the edifice. 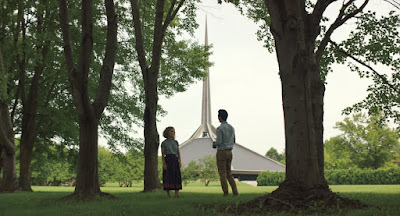 Indeed, throughout the movie Kogonada sets the duo in long shots when they discuss architecture so that we can see the buildings they discuss, like a church spire rising up between them, giving the impression of an inanimate chaperone. Yet when matters turn personal, and occasionally they do, Kogonada cuts to the characters’ faces in much more traditional shot-reverse shot close-ups. Even there, however, his attention to detail remains distinct, like a conversation in a covered bridge where Jin mentions how his people believe that failing to be present at the death of a family member means your own spirit roams aimlessly and becomes a ghost. As he says this, the smoke from his cigarette drifts upward, framing his face, transforming him into something akin to a smoky specter. It is commendable that throughout their talks Jin is not urging her to stay with him, respecting their age difference, but to go elsewhere, to expand her horizons. But the movie also knows that Jin telling her is not enough; she has to find that desire within herself. And if she has spent so much of her adolescence into young adulthood looking at everything around her, she gradually begins looking inwardly, seeing herself from another angle, realizing she might see the mother she has convinced herself she needs to stick around to care for from the wrong angle. And if Kogonada enlivens one idiom, he does the same for another, improbably literalizing the notion of Crossing the Bridge as the movie draws its curtain, and the image, taken together with the preceding emotions, render a mere cable-stayed bridge as something like a portal to another dimension.